European Holiday! // Europäischer Feiertag! After recordings surfaced of Trump bragging about sexually assaulting women, and numerous women have come forth describing past encounters where Trump groped them, Michelle Obama took to the campaign trail to call out the Republican nominee for President of the United States on his disgusting behavior. Die Zeit zum Handeln ist gekommen. Wer gedacht hat, dass in Donald Trump ein Schaumschläger steckt, ein gut kaschierter Demokrat, dem es nur um Ruhm und Eitelkeit geht, der täuscht sich. Gewaltig. Hier ist ein Demagoge, Rassist und - ja, auch das, ja, gerade das - ein Faschist ins Weiße Haus eingezogen. Was wir in den nächsten Wochen und Monaten zu erwarten haben? Die demokratischen Kräfte müssen nun zusammenstehen, weltweit. Trump, was wir nicht vergessen dürfen, hat als US-Präsident die Kontrolle über die amerikanischen Atombomben. Ein cholerischer Faschist hat die Geheimcodes des amerikanischen Atomarsenals ausgehändigt bekommen. Trump muss von seinem Amt entfernt werden. So schnell es geht. Wir müssen uns engagieren. Mahnwachen organisieren, vor US-Botschaften und US-Konsulate ziehen, NGOs in ihrer Arbeit unterstützen, aktiv und finanziell. Wir müssen Klagen einreichen, wo immer es uns möglich ist. Tausende von Klagen. Wir müssen Trump und all die anderen Faschisten vor jeden erreichbaren Gerichtshof zerren. Wir müssen auf unsere Regierungen einwirken, der Trump-Administration die harte Linie aufzuzeigen. Handel ersetzt nicht Demokratie. Niemals, unter gar keinen Umständen. Geld ist nichts, wenn es keine Freiheit, keine Gerechtikeit gibt. Wer wie Theresa May, die britische Premierministerin, sich bei Trump unterwürfig verhält, zu allem Ja und Amen sagt, verrät unsere demokratischen Werte. Wir müssen den rechtsradikalen Parteien in unseren eigenen Staaten ihre Grenzen aufzeigen. Wir müssen unseren Verstand benutzen und mutig sein. Auf der Stelle, sofort, nicht erst morgen oder übermorgen. Die Zeit der Duckmäuserei ist vorbei. Alle vier Jahre seine Stimme bei Wahlen abzugeben, reicht nicht. Los! Raus mit uns! Wie soll die Welt aussehen, in der wir leben wollen? Wehrt Euch! Und wehret den Anfängen! Jetzt. Zögert nicht. Ansonsten holt uns die faschistische Vergangenheit ein - und zwar schneller als wir denken. Sagt nicht, Ihr hättet nichts gewusst. Sagt nicht, Ihr hättet es nicht gesehen. Sagt nicht, die Kastanien sollen andere für Euch aus dem Feuer holen. In Zeiten wie diesen zeigt sich, was für DemokratInnen wir sind. Fragt nicht, was die Demokratie für Euch tun kann, tut etwas für die Demokratie. Trump ist unsere Bewährungsprobe. Lasst sie uns bestehen! Beweist, wozu DemokratInnen fähig sind. The American Civil Liberties Union (ACLU) is a nonpartisan, non-profit organization whose stated mission is "to defend and preserve the individual rights and liberties guaranteed to every person in this country by the Constitution and laws of the United States." It works through litigation, lobbying, and community empowerment. Founded in 1920 by Roger Baldwin, Crystal Eastman, Walter Nelles, Morris Ernst, Albert DeSilver, Arthur Garfield Hays, Jane Addams, Felix Frankfurter, and Elizabeth Gurley Flynn, the ACLU has over 500,000 members and an annual budget of over $100 million. 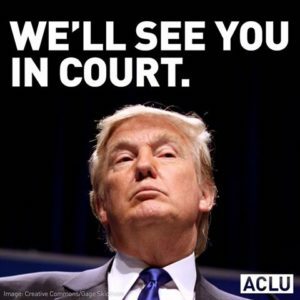 Join ACLU! Become a Freedom Fighter! Fight fascism! Fight Trump! Commencing at 9am on January 20, 2017, the day of the inauguration of the 45th President of the United States, the public is invited to deliver the words "HE WILL NOT DIVIDE US" into a camera mounted on a wall outside the Museum of the Moving Image, New York, repeating the phrase as many times, and for as long as they wish. Open to all, 24 hours a day, seven days a week, the participatory performance will be live-streamed continuously for four years, or the duration of the presidency. In this way, the mantra "HE WILL NOT DIVIDE US" acts as a show of resistance or insistence, opposition or optimism, guided by the spirit of each individual participant and the community. The visa-issuance process plays a crucial role in detecting individuals with terrorist ties and stopping them from entering the United States. Perhaps in no instance was that more apparent than the terrorist attacks of September 11, 2001, when State Department policy prevented consular officers from properly scrutinizing the visa applications of several of the 19 foreign nationals who went on to murder nearly 3,000 Americans. In order to protect Americans, the United States must ensure that those admitted to this country do not bear hostile attitudes toward it and its founding principles. The nation’s founding principles, as reflected in the Declaration of Independence, included dissatisfaction with what were said to be overly restrictive immigration practices. The United States cannot, and should not, admit those who do not support the Constitution, or those who would place violent ideologies over American law. Does Mr. Trump have the power to do this? To temporarily reduce investigative burdens on relevant agencies during the review period described in subsection (a) of this section, to ensure the proper review and maximum utilization of available resources for the screening of foreign nationals, and to ensure that adequate standards are established to prevent infiltration by foreign terrorists or criminals, pursuant to section 212(f) of the INA, 8 U.S.C. 1182(f) . . . The tension between the two laws has not been definitively resolved by the courts. Jennifer Chacon, a law professor at the University of California, Irvine, said that a challenge to the executive order based on the later law’s equal-protection principles was the most promising line of attack. In an opinion article in The New York Times, David J. Bier, an immigration policy analyst at the Cato Institute, a libertarian group, said Mr. Trump had at least violated the spirit of the later law.
. . . I hereby proclaim that the immigrant and nonimmigrant entry into the United States of aliens from countries referred to in section 217(a)(12) of the INA, 8 U.S.C. 1187(a)(12), would be detrimental to the interests of the United States, and I hereby suspend entry into the United States, as immigrants and nonimmigrants, of such persons for 90 days from the date of this order . . . The countries are Iraq, Syria, Iran, Sudan, Libya, Somalia and Yemen.
. . . (excluding those foreign nationals traveling on diplomatic visas, North Atlantic Treaty Organization visas, C-2 visas for travel to the United Nations, and G-1, G-2, G-3, and G-4 visas). These exceptions are mostly for diplomats, people traveling to the United Nations in New York, and others involved in international organizations. The Secretary of Homeland Security, in consultation with the Secretary of State, shall submit to the President a list of countries recommended for inclusion on a Presidential proclamation that would prohibit the entry of foreign nationals. The initial list may soon change and expand. The Secretary of State shall suspend the U.S. Refugee Admissions Program (USRAP) for 120 days. This provision suspends all admissions of refugees, not limited to the seven countries. Upon the resumption of USRAP admissions, the Secretary of State, in consultation with the Secretary of Homeland Security, is further directed to make changes, to the extent permitted by law, to prioritize refugee claims made by individuals on the basis of religious-based persecution, provided that the religion of the individual is a minority religion in the individual’s country of nationality. As a general matter, this will give priority to Christian refugees over Muslim ones. Though framed in a neutral way, this part of the order may raise questions of religion-based discrimination. Mr. Trump has said that he means to favor Christian refugees. Pursuant to section 212(f) of the INA, 8 U.S.C. 1182(f), I hereby proclaim that the entry of nationals of Syria as refugees is detrimental to the interests of the United States and thus suspend any such entry until such time as I have determined that sufficient changes have been made to the USRAP to ensure that admission of Syrian refugees is consistent with the national interest. This effectively expands the ban on immigrants from Syria. This cuts the cap on refugees in half. The world rejects your fear, hate-mongering, and bigotry. We reject your support for torture, your calls for murdering civilians, and your general encouragement of violence. We reject your denigration of women, Muslims, Mexicans, and millions of others who don’t look like you, talk like you, or pray to the same god as you.